Using a shop rag, clean off any foreign object from the parts. Apply all of the sliding and rotating surfaces with hypoid gear oil. (a) Install the 2 side gear thrust washers to the side gears. (b) Install the 2 side gears to the RH case. (c) Install the 4 pinion gears and pinion gear thrust washers to the spider. (d) Install the pinion gears with the spider to the RH case. Measure at all 4 locations. Measure the backlash at the RH case and at the LH case. If the backlash is not within the specification, install a thrust washer of a different thickness. (f) Align the matchmarks on the LH and RH cases. (g) Torque the 8 bolts uniformly a little at a time. (a) Clean the contact surfaces of the differential case and ring gear. (b) Heat the ring gear to approx. 100C (212F) in boiling water. (c) Carefully take the ring gear out of the boiling water. (d) After the moisture on the ring gear has completely evaporated, quickly install the ring gear to the differential case. HINT: Align the matchmarks on the ring gear and differential case. (e) Temporarily install 5 new lock plates and 10 bolts so that the bolt holes in the ring gear and differential case are not misaligned. (f) After the ring gear has cooled sufficiently, torque the 10 ring gear set bolts. (g) Using a chisel and hammer, stake the 5 lock plates. HINT: Stake the claws of the lock plates to fix the bolts. For the claw contacting the protruding portion of the bolt, stake only the half of it along the tightening direction. Using SST and a press, install the 2 side bearings to the differential case. (a) Place the bearing outer races on their respective bearings. Check that the left and right outer races are not interchanged. (b) Install the assembled plate washers onto the side bearing. (c) Install the differential case in the differential carrier. HINT: If it is difficult to install the differential case into the carrier, replace the plate washer with a thinner one. However, select a plate washer that allows no clearance between it and the carrier. (d) Align matchmarks on the bearing cap and differential carrier. (e) Install and uniformly tighten the 4 bolts a little at a time. (f) Using a dial indicator, measure the ring gear runout. (g) Remove the differential carrier. (a) Using SST and a press, install the front bearing outer race. (b) Using SST and a press, install the rear bearing outer race. (a) Install the washer on the drive pinion. HINT: First fit a washer with the same thickness as the washer which was removed, then after checking the tooth contact pattern, replace the washer with one of a different thickness if necessary. (b) Using SST and a press, install the front bearing onto the drive pinion. (a) Install the drive pinion and rear bearing. HINT: Assemble the spacer and oil seal after adjusting the gear contact pattern. (b) Install the oil slinger. (c) Using SST, install the companion flange. (d) Using SST to hold the flange and adjust the drive pinion preload by tightening the nut. Coat the nut and threads of the drive pinion with gear oil. As there is no spacer, tighten the nut a little at a time, being careful not to overtighten. (e) Using a torque wrench, measure the preload. HINT: Measure the total preload after turning the bearing clockwise and counterclockwise several times to make the bearing smooth. (b) Install the differential case in the differential carrier. (a) Install the plate washer on the ring gear back side. HINT: Make sure that the ring gear has backlash. (b) Tap on the ring gear with a plastic hammer so that the washer fits to the bearing. (c) Using a dial indicator, measure the side gear backlash while holding one pinion gear toward the differential case. (d) Select a plate washer for back side ring gear, using the backlash as reference. (e) Select a ring gear teeth side plate washer so that is no clearance between the outer race and case. (f) Remove the plate washers and differential case. (g) Install the plate washer into the ring gear back side of the carrier. (h) Place the other plate washer onto the differential case together with the outer race, and install the differential case with the outer race into the carrier. (i) Tap on the ring gear with a plastic hammer so that the washers fit to the bearing. (j) Using a dial indicator, measure the ring gear backlash. If the backlash is not within the specification, adjust by either increasing or decreasing the thickness of washers on both sides by an equal amount. HINT: There should be no clearance between the plate washer and case. Make sure that there is ring gear backlash. (a) Remove the ring gear teeth side plate washer and measure the thickness. (b) Using the backlash as a reference, install a new washer of 0.06 - 0.09 mm (0.0024 - 0.0035 in.) thicker than the washer removed. HINT: Select a washer which can be pressed in 2/3 of the way with your finger. (c) Using a plastic hammer, install the plate washer. (e) Tighten the 4 bolts. HINT: Turn the ring gear several times to make the side bearings smooth. (f) Using a dial indicator, adjust the ring gear backlash until it is within the specification. Backlash: 0.13 - 0.18 mm (0.0051 - 0.0070 in.) If the backlash is not within the specification, adjust by either increasing or decreasing the thickness of washers on both sides by an equal amount. HINT: The backlash will change by about 0.02 mm (0.0008 in.) corresponding to 0.03 mm (0.0012 in.) change in the plate washer. Using a torque wrench, measure the total preload. (a) Coat 3 or 4 teeth at 3 different positions on the ring gear with red lead primer. (b) Hold the companion flange firmly and rotate the ring gear in both directions. 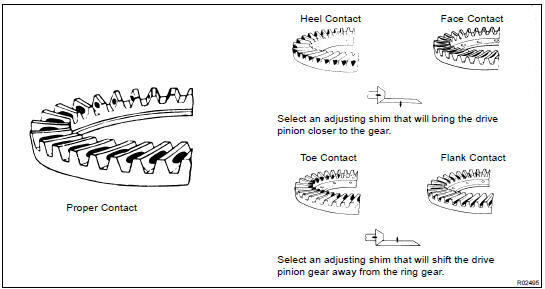 (c) Inspect the tooth contact pattern. 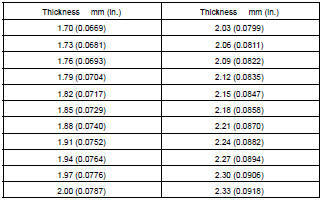 If the teeth are not contacting properly, use the following table to select a proper washer for correction. (a) Install a new bearing spacer. (b) Using SST and a hammer, install a new oil storage ring. Using SST and a hammer, install the bearing outer race. (a) Coat the hypoid gear oil to a new oil seal periphery. (a) Using SST, install the companion flange. (b) Coat the thread of a new nut with hypoid gear oil LSD. (c) Using SST to hold the flange, tighten the nut. Using a torque wrench, measure the drive pinion preload using the backlash of the drive pinion and ring gear. If the preload is greater than the specification, replace the bearing spacer. 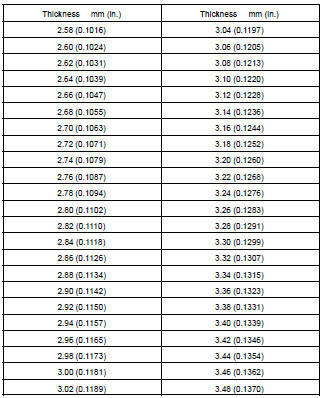 If the preload is less than the specification, retighten the nut a force of 13 NÂ·m (130 kgfÂ·cm, 9 ftÂ·lbf) at a time until the specified preload is reached. If the maximum torque is exceeded while retightening the nut, replace the bearing spacer and repeat the preload procedure. Do not loosen the pinion nut to reduce the preload. Using SST and a press, install the bearing to side gear shaft. (a) Clean surfaces with FIPG material attached to using gasoline or alcohol. (b) Apply FIPG to the differential tube. FIPG: Part No. 08826 - 00090, THREE BOND 1281 or equivalent. HINT: Install the differential tube within 10 minutes after applying FIPG. (c) Install the differential tube with 4 bolts to the differential tube. (d) Install the side gear shaft. (e) Using a snap ring expander, install the snap ring. (f) Using SST, install the snap ring. (b) Using SST and a hammer, install 2 new oil seals. 31. REMOVE DIFFERENTIAL CARRIER FROM OVERHAUL STAND, ETC. (a) Install the oil deflector with 2 bolts to the carrier cover. (b) Install the breather plug to the carrier cover. (c) Remove any old FIPG material and be careful not to drop oil on the contact surfaces of the differential carrier and carrier cover. (d) Clean surfaces with FIPG with material attached to using gasoline or alcohol. (e) Apply FIPG to the carrier cover, as shown. FIPG: Part No. 08826-00090, THREE BOND 1281 or equivalent. HINT: Install the carrier cover within 10 minutes after applying FIPG. (f) Install the differential carrier cover with the 9 bolts.